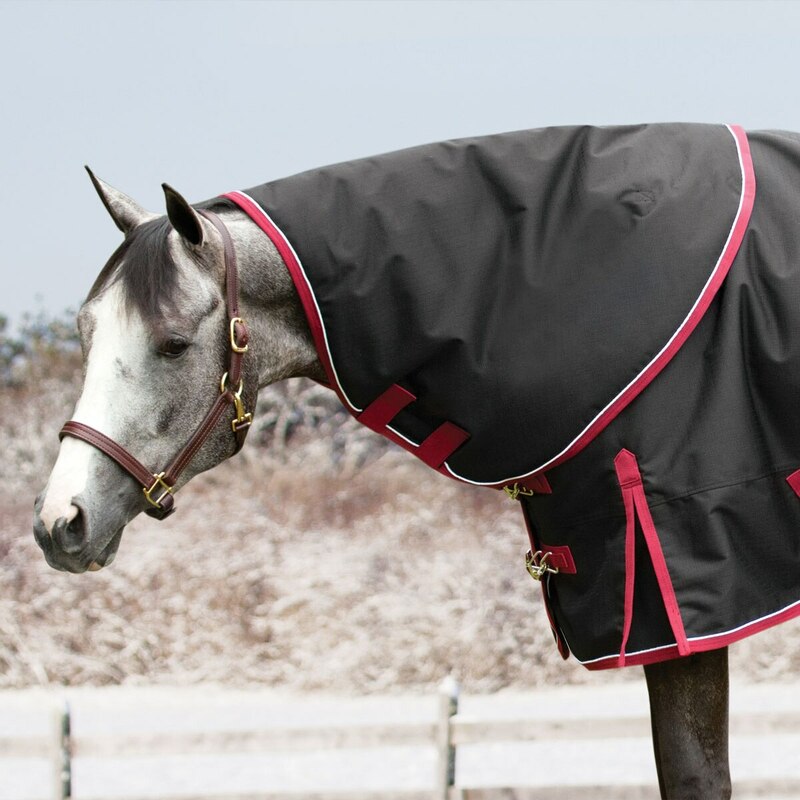 Give your horse additional protection for his neck with the Rockin' SP® Deluxe Neck Rug. The 1200D ripstop polyester outer is just as tough as the rest of the SmartPak Deluxe Turnout line and the silky nylon lining will help prevent unsightly and uncomfortable rubbing. Plus, it has a unique cut specifically designed to give Quarter Horses and other stock breeds an ideal fit. Finally, sturdy snap attachments and two additional hook and loop closures let you easily and securely attach the rug to your turnout. Rockin' SP® Deluxe Waterproof Neck Rug is rated 4.6 out of 5 by 20. Rated 4 out of 5 by Jackie from Perfect Fit Perfect fit. Wish it had more clasps instead of velcro. Other than that it is something i would buy again. Rated 5 out of 5 by Sandalwood from Fits well and doesnt gape on the back Im really glad I got this neck cover. It fits perfectly with my Ultimate Turnout Sheet and doesnt leave a gap behind the cover in front of the sheet. Keeps my horse's clipped neck warm and clean! Rated 5 out of 5 by Francine from Super neck rug I bought this rug to go with my horse's Rocking SP blanket. It is so well made and I love how they protect my guy from the colder weather. Rated 5 out of 5 by Adam from Very durable! Had this a month and it's super durable and high quality! Rated 5 out of 5 by zeb5016 from Great fit I bought this product for my quarter horse. It fits him great, it runs true to the size. I also love it because it keeps him warmer on those extra cold days and eliminates the need to use a slinky in the winter except for extremely bad weather. Rated 5 out of 5 by StarLBI from Fits Well! I have a Big D blanket, and was looking to buy a neck cover to go with it as Big D doesn't have turnout neck covers. This fits perfectly with my blanket, and is holding up well! Rated 5 out of 5 by Brittany Holy from Must have addition to your turnout Very easy and quick to put on and the same great quality as the blanket. It attaches to the turnout with one snap and 2 Velcro straps and velcros underneath.